The invention relates to solid, porous materials with a core-shell structure on the basis of synthetic polymers and/or biopolymers (A), which are soluble in chaotropic liquids (C) and insoluble in protic polar inorganic liquids (D1) and protic polar organic liquids (D2). The invention also relates to a method for their production and to the use thereof. The present invention relates to novel, solid, porous materials having a core-shell structure on the basis of synthetic polymers and biopolymers. Moreover, the present invention relates to a novel process for the preparation of solid, porous materials based on synthetic polymers and biopolymers. Not least, the present invention relates to the use of the new, solid, porous materials having a core-shell structure on the basis of synthetic polymers and biopolymers as well as the solid, porous materials produced by the new process. The preparation of solid materials on the basis of biopolymers such as polysaccharides, which optionally also contain additives, using chaotropic liquids, particularly ionic liquids is known from the international and US Patent Applications and US Patents WO 03/029329 A2, US 2003/0157351 A1 WHERE 2004/084627 A2, US 2004/0038031 A1, US 6,824,599, US 6,808,557, US 2004/0006774 A1, WO 2007/057235 A2 and WO 2007/085624 A1. In these known processes is a polysaccharide, in particular cellulose, optionally together with additives dissolved in an ionic liquid. Subsequently, the solution is introduced into a liquid medium which is miscible with the ionic liquid, but not capable of dissolving the polysaccharide. Thus, the polysaccharide is regenerated. Suitable liquid media include water, alcohols, nitriles, ethers or ketones, or consist thereof. Preferably, water is used because can then be dispensed with the use of volatile organic solvents. Typically, the regenerated polysaccharide is obtained in the form of a gel. When drying the regenerated polysaccharide gel shrinks and the result is a solid state on the basis of polysaccharide. It is not known if the solids formed have a core-shell structure, and whether they are porous. From the American patent US 5,328,603 a method for the production of porous beads based on cellulose having a particle size of at least 0.3 mm is known, in which polar cellulose in a chaotropic liquid, in particular in a saturated solution of lithium chloride or calcium thiocyanate in a organic solvent such as dimethylacetamide, dissolves, atomizes the resulting solution and introducing the resulting droplets in a liquid which is miscible with the chaotropic liquid, but not capable of dissolving cellulose. Suitable liquid media, especially water, methanol or water-methanol mixtures. In this case, the droplets solidify and form beads, which can be washed with water and isolated. Although these spheres are porous, however, they have no core-shell structure. Furthermore, with these known methods the risk of irregular beads are formed with a wide particle size distribution. Total dese disadvantages complicate the targeted and reproducible production of powder particles on the basis of regenerated polysaccharide, so that the powder particles for various applications for technical and economic reasons, are not eligible. From the American patent application US 2006/0151 170 A1 a method of stimulating oil and gas sources indicate. In this method, a thickened liquid medium, the deformable particles contains, in the form of spheres, cylinders, cubes, rods, cones or irregular shapes having a particle diameter of 850 .mu.m, is pressed under pressure into a wellbore. Here, new cracks and fissures in the oil or gas formation are formed, through which passes the oil or natural gas back to the borehole more readily. This method of well stimulation is known in the oil and gas handling technology as "fracturing". The deformable particles serve as support particles or support materials which prevent the newly formed cracks and fissures are closed again by the pressure of the overlying rock. These supporting particles or support materials are referred to in the natural gas and oil producing art as "proppants". The deformability of the proppants prevented to a certain degree the formation of finely divided material through abrasion of rock material and / or by breaking the proppants, as is common in the use of hard proppants such as sand fracturing. The deformable proppants have thus to some extent the effect of support pads. In the known fracturing techniques are deformable proppants of crushed natural products such as geschitzelte, ground or crushed nut shells, fruit seeds, plants shells or wood parts may be used. However, they must be provided with a protective layer to adjust the elastic modulus of the proppants to the respective requirements. In addition, the known deformable proppants the disadvantage that their chemical compositions and mechanical properties vary greatly, so that extensive tests are necessary to check whether a delivered batch is suitable given oil or gas formation for one. The present invention was therefore based on the object to provide novel, solid, porous materials based on synthetic polymers and biopolymers which have a core-shell structure. In addition, the cores of these new, solid, porous materials should be relatively hard and have a uniform porous structure. It also aims to be the shells of these novel solid, porous materials softer and more compact than the seeds and have a uniform thickness. For example, spherical particles, irregularly or regularly shaped, non-spherical particles, plates, rods, cylinders, needles, flakes, threads, fabrics, or films, can be made available, which are all have a high mechanical stability. Moreover, it was the object of the present invention to provide a novel process for the preparation of solid, porous materials based on synthetic polymers and biopolymers, which no longer has the disadvantages of the prior art longer. Communication technology, radio and television technology, agricultural technology, aviation and space technology and textile technology, as well as construction, land and sea transport system and engineering, be used with advantage. Here, they are particularly suited as support particles supporting materials or proppants, construction materials, insulation, fabrics, absorbents, adsorbents, membranes, separating materials, barrier layers, controlled release materials, catalysts, cultivation media, catalysts and color pigments, fluorescent, phosphorescent, electrically conductive, magnetic, microwave radiation absorbing and flame-retardant materials or are suitable for their preparation. Accordingly, the new, solid, porous materials having a core-shell structure on the basis of synthetic polymers and / or biopolymers (A), which in chaotropic liquids (C) soluble and in protic polar inorganic liquids (D1), and in protic polar were organic liquids (D2) are insoluble found. The following are the new solid porous materials will be referred to as "inventive materials." In the following, the novel process for the preparation of solid, porous materials based on synthetic polymers and / or biopolymers (A) will be referred to as "the invention". Moreover, the use of the materials according to the invention as well as the solid, porous materials produced by the inventive method has been based on synthetic polymers and biopolymers (A) and the inventive materials in synthetic and analytical chemistry, biochemistry and genetic engineering, biology, pharmacology and medical diagnostics, cosmetics, oil and gas handling equipment, process technology, paper, electrical, magnetic equipment, communications equipment, radio and television technology, agricultural technology, aviation and space technology and textile technology, as well as construction, land and sea transport beings and mechanical engineering found what hereinafter collectively as " inventive use "is called. In view of the prior art it was surprising and unforeseeable for the skilled person that the task at the present invention is based could be achieved by using the inventive materials, the inventive method and the inventive use. In particular, it was surprising that the method according to the invention, the materials according to the invention provided with a core-shell structure. As desired, the cores of the inventive materials were relatively hard and had a uniform porous structure. Furthermore, were the shells of the inventive materials softer and more compact than the seeds and had a uniform thickness. Overall, the inventive materials in the swollen state had a high mechanical stability. They had a higher absorption capacity than the known materials based on polysaccharides. They could be in a variety of three-dimensional shapes, such as spherical particles, irregularly or regularly shaped, providing non-spherical particles, plates, rods, cylinders, needles, flakes, threads, fabrics or films, which all had a high mechanical stability. Also surprising that the inventive method not having the disadvantages of the prior art longer. Above all, the method of the invention gave the inventive materials in a simple and very well reproducible manner, which surprisingly showed the above described desired properties. Not least, were materials of the invention and prepared by the process of the invention solid, porous materials based on synthetic polymers and biopolymers (A), in particular materials of the invention, particularly wide, in particular in synthetic and analytical chemistry, biochemistry and genetic engineering, biology, pharmacology, medical diagnostics, cosmetics, oil and gas handling equipment, process technology, paper technology, packaging, electrical, magnetic equipment, communications equipment, radio and television technology, agricultural technology, aviation and space technology and textile technology, as well as construction, land and sea transport beings and mechanical engineering, can be used with advantage. Here they lent themselves particularly suited as support particles supporting materials or proppants, construction materials, insulation, fabrics, absorbents, adsorbents, membranes, separating materials, barrier layers, controlled release materials, catalysts, cultivation media, catalysts and color pigments, fluorescent, phosphorescent, electrically conductive, magnetic, microwave radiation absorbing and flame-retardant materials or their manufacture. More specifically, appropriated those prepared by the novel process pulverförm strength solid materials based on synthetic polymers and / or biopolymers suited as a wear-resistant, pressure-resistant, deformable proppants in liquid media for fracturing for the purpose of a highly effective and particularly long-lasting well stimulation in promoting natural gas and oil. Thus, the flow rates could be significantly increased. The inventive materials are solid. This means that they are up to at least 50 0 C, preferably to at least 100 0 C, preferably to at least 200 ° C and in particular up to at least 250 0 C are fixed and do not have a phase transition to a liquid or gaseous state. The inventive materials are porous. This means that they have a foam-like or sponge-like structure. The structure may be closed cell or open-pore. Preferably, it is porous, ie, it is permeable to gases and liquids. The materials of the invention have a core-shell structure. Although the cores and the shells may have different material compositions. Preferably, the cores and the shells have the same material composition. but they differ in their internal structure or its structure. Preferably, the shells are firmly bonded with the cores so that they do not dissolve during mechanical loading of the cores. Preferably, the cores of the inventive materials are coarsely porous or finely porous. These properties will pore "refer to Römpp Online 2008,". the pores preferably have a diameter of 50 nm to 10 .mu.m, particularly preferably 500 nm to 8 microns, most preferably 1 micron to 7 microns and especially from 1 .mu.m to 5 .mu.m. The nuclei of the materials of the invention may be harder or softer than their shells. This means that the shells can be deformed easier or harder than the cores or, in other words, that the material is the seeds rigid or less rigid than the material of the shells. Preferably, the cores are harder than the shells. The cores and the shells of the materials of the invention may have a different porosity. So the shells can be more compact than the cores and vice versa. Preferably, the shells are more compact than the cores, that is, they have a lower porosity than the cores. To the term porosity is porosity "refer to Römpp Online 2008,". Preferably, the pores of the shells have a diameter of 1 to <50 nm. The strength of the shells of the materials of the invention may vary widely. Preferably they have a thickness of 1 to 100 .mu.m, preferably 5 to 90 .mu.m, particularly preferably 10 to 80 microns and especially 15 to 70 microns. Sizes and morphologies are present. Preferably, the size of 100 nm to 10 mm varies. This means that the three-dimensional shapes micro or macro forms. As for the three-dimensional shapes, materials of the invention can be present for example as spherical particles, irregularly or regularly shaped, non-spherical particles, sheets, rods, cylinders, needles, flakes, threads, fabrics or films. Preferred materials of this invention are as spherical particles, particularly preferably as beads or pearls, before. The particle size of the balls or beads according to the invention may vary very widely and are thereby excellently adapted to the requirements of the case. Preferably, they have a measured by sedimentation in a gravitational field average particle size of 0.1 to 10 mm, preferably 0.2 to 5 mm and in particular 0.3 to 2 mm. The particle size distribution can be multimodal or monomodal. Preferably, it is monomodal. In addition, the particle size distribution may be narrow or ready. it is closely preferably, ie, balls or the inventive beads have only minor fine and coarse fractions on. The base materials of the present invention forms at least one, in particular a synthetic polymer and / or biopolymer (A). This means exists or that a given material of the invention contains a synthetic polymer and / or biopolymers (A) that a given material of the invention from a synthetic polymer and / or biopolymer (A), but the synthetic polymer and / or biopolymer (A) the three dimensional structure substantially or alone determined. Subsequently, the synthetic polymer and / or biopolymer are also collectively referred to as "polymer (A)" or "polymer (A)", respectively. Virtually all synthetic polymers and biopolymers (A) are suitable for this purpose, provided that they in one of the chaotropic liquids described below (C) soluble, and in the below-described protic polar inorganic liquids (D1) and protic polar organic liquids (D2) insoluble are. Preferably, the synthetic polymers (A) selected from the group consisting constructed from random, alternating and block, linear, branched, and comb, oligomeric and polymeric (co) polymers of ethylenically unsaturated monomers, polyaddition resins and polycondensation resins (see FIG. Römpp Lexikon Lacke und Druckfarben, Georg Thieme Verlag, Stuttgart, New York, 1998, page 457, "polyaddition" and "polyaddition resins (polyadducts)", pages 463 and 464, "polycondensates", "polycondensation" and "polycondensation resins") selected. (Meth) acrylate (co) polymers are preferred, polyurethanes and polyesters, more preferably polyesters used. The synthetic polymers and biopolymers (A) can be prepared in the process according to the invention in situ as described below chaotropic liquid (C). Polysaccharides are preferably used (A). Here, the polysaccharides (A) homopolysaccharides or heteropolysaccharides and proteoglycans include wherein the Polysacharidanteil outweighs the protein portion. The invention materials may further comprise at least one additive (B). As additives (B) may be basically used in gaseous, liquid and solid, preferably liquid and solid materials as long as they do not undesirably with the polysaccharides (A) and the chaotropic liquids used in the process according to the invention described below, (C react), and / or liquid media (D1) and / or (D2), such as substances with a strong positive redox potential such as platinum hexafluoride or strongly negative redox potential such as metallic potassium, and / or explosively decompose in an uncontrolled manner, such as Schwermetallazide. Preferably, the additives (B) selected from the group consisting of low molecular mass, oligomeric and polymeric, organic, inorganic and organometallic compounds, organic, inorganic and organometallic nanoparticles and microscopic and macroscopic particles and moldings, biomolecules, cell compartments, cells and cell selected. The breadth of suitable additives (B) is therefore virtually unlimited. Therefore, the invention materials can be varied almost arbitrarily in the desired manner, which is one of their special advantages. The selection of the additive (B) or the additives (B) is aimed primarily after which technical, sensory and / or aesthetic effects one wants to achieve in or with the inventive materials. Thus, the additives may be (B), the physical or structural properties, such as density, strength, flexibility, nanoporosity, the microporosity, the macroporosity, the absorption capacity, the adsorption ability and / or the barrier effect against gases and liquids, the materials of the invention influence as such and may vary appropriately. So can be varied for example by means of plasticizers, such as structural proteins such as keratin, urea, monosaccharides such as glucose, polysaccharides such as cyclodextrins or polyoses, the flexibility and permeability of the inventive materials. The additives (B) but can impart having the additives (B) as such the materials of the invention, they contain properties. Thus, the additives (B) compounds dyes, catalysts, colorants, fluorescent, phosphorescent, electrically conductive, magnetic or microwave radiation absorbing pigments, light stabilizers, vitamins, provitamins, antioxidants, peroxide decomposers, repellent, radioactive and non-radioactive non-metal and / or metal ion-containing , compounds absorb such ions, flameproofing agents, hormones, diagnostic agents, pharmaceuticals, biocides, insecticides, fungicides, acaricides, fragrances, flavoring agents, flavoring agents, ingredients of food, engineering plastics, enzymatically or non-enzymatically active proteins, structural proteins, antibodies, antibody fragments, nucleic acids , be genes, nuclei, mitochondria, membrane materials, ribosomes, chloroplasts, cells, or blastocyst. Examples of additives (B) are known from International patent application WO 2004/084627 A2 or US patent application US 2007/0006774 A1. The additives (B) may be produced in the polymer (A) formed matrix, in particular in the polysaccharide matrix, the materials according to the invention and using the method of the invention, solid porous materials on the basis of polymers (A), especially of polysaccharides (A) present more or less homogeneously distributed. For example, it may be advantageous if fibrous additives (B) have a non-homogeneous distribution in order to vary mechanical properties in the desired manner. The same is true for catalytically active additives (B), their accessibility can be improved in the polymer (A) formed matrix, in particular in the polysaccharide matrix by an inhomogeneous distribution. In many cases, however, is a very homogeneous distribution in the polymer (A) formed matrix, in particular in the polysaccharide matrix, an advantage be used for example when softening additives (B). The additives (B) may be formed with the polymer (A) matrix, in particular of the polysaccharide matrix to be more or less permanently connected. In particular, can be polymeric or particulate additives (B) formed on the duration from the polymer (A) matrix, in particular the polysaccharide matrix, respectively. In contrast, it may be particularly in the low molecular weight additives (B) of advantage if they are not connected permanently with the matrix, but to be released again in terms of a "slow release" or "controlled release". The amount of additive (B) or additives (B) contained in a given material of this invention, may vary very widely and depends mainly on their physical, chemical and structural properties on the one hand and according to the technical, physiological and / or aesthetic effects that you want to adjust. The skilled worker is therefore set in individual cases suitable ratios in a simple manner on the basis of his general knowledge optionally with the aid of a few exploratory experiments. The invention materials may be produced using conventional and known methods. According to the invention it is advantageous to prepare them according to the inventive method. In the first step of the method according to the invention is at least one, especially one, of the above-described polymers (A), optionally in the presence of at least one of the above-described additives (B) in at least one, especially one, entirely or substantially anhydrous chaotropic liquid (C) solubilized. The verb "solubilized" or the term "solubilization" mean in the context of the present invention that the polymer (A) in the chaotropic liquid (C) molecularly dissolved or at least so finely divided and homogeneous as possible is dispersed. The same applies to the additives (B), when used with. Under "chaotropic" is the property of substances, particularly liquids, to understand supramolecular assemblies of macromolecules by disrupting or influencing the intermolecular interactions such as hydrogen bonds dissolve, without affecting the intramolecular covalent bonds (see a.. Römpp online 2008, "chaotrope"). The chaotropic liquids used in the inventive process (C) are entirely or substantially anhydrous. "Substantially anhydrous" means that the water content of the chaotropic liquids (C) <5 wt .-%, preferably <2 wt .-%, preferably <1 wt .-% and in particular <0.1 wt .-%. "Completely free of water" means that the water content below the detection limits of the conventional methods is for the quantitative determination of water. 100 0 C to +150 0 C, preferably -50 ° C to +130 0 C, in particular -20 ° C to + 100 ° C in liquid form. That is, the chaotropic liquids (C) has a melting point of preferably not more than 150 0 C, preferably not more than 130 0 C and in particular at most 100 0 C.
Very particularly effective chaotropic liquids (C) are the so-called ionic liquids. They are therefore very particularly preferably used. Ionic liquids consist entirely of ions (cations and anions). They may consist of organic cations and organic or inorganic anions or cations of inorganic and organic anions. In principle, ionic liquids are molten salts with a low melting point. It not only converts the liquid at the ambient temperature, but also all salt compounds to the preferred melt preferably below 150 0 C 130 0 C and in particular below 100 ° C. Unlike conventional inorganic salts such as sodium chloride (melting point 808 0 C), ionic liquids are reduced by charge delocalization lattice energy and symmetry, which may for solidification points down to -80 0 C and run underneath. Due to the numerous possible combinations of anions and cations, ionic liquids with very different properties (Römpp Online 2007, "ionic liquids" see. A.) Can be produced. Suitable organic cations all the cations are concerned, as they are commonly used in ionic liquids. Preferably, it is non-cyclic or heterocyclic onium compounds. quaternary ammonium cations and most preferably heterocyclic quaternary ammonium cations are particularly preferred. Pyrazolium, 1-pyrazolinium, 2-pyrazolinium, 3-pyrazolinium, 2,3-dihydro imidazolinium, 4,5-dihydro-imidazolinium, 2,5-dihydro-imidazolinium, pyrrolidinium, 1, 2,4-triazolium (quaternary nitrogen atom in the 1-position), 1, 2,4-triazolium (quaternary nitrogen atom in 4-position), 1, 2,3-triazolium (quaternary nitrogen atom in the 1-position), 1 , 2,3-triazolium (quaternary nitrogen atom in 4-position), oxazolium, Isooxazolium-, thiazolium, Isothiazolium-, pyridinium, pyridazinium, pyrimidinium, piperidinium, morpholinium, pyrazinium, indolium, quinolinium -, isoquinolinium, Chinoxalinium- and indolinium cations selected. are described in detail. The listed passages of patent applications is expressly made for the purpose of clarifying the present invention. From the above-described organic cations are especially imidazolium cations, in particular the 1-ethyl-3-methylimidazolium cation (EMIM) or the 1-butyl-3-methylimidazolium cation (BMIM), wherein the quaternary nitrogen in each case 1 - position is used. Suitable inorganic cations all the cations are concerned, the (C) form with the organic anions of the ionic liquids no crystalline salts whose melting point is above 150 0 C. Examples of suitable inorganic cations are the cations of the lanthanides. Suitable inorganic anions are basically all of the anions are concerned, the (C) form with the organic cations of the ionic liquids no crystalline salts whose melting point is above 150 0 C, and no undesirable interactions with the organic cations, such as chemical reactions, received. Preferably, the inorganic anions from the group consisting of halide, pseudohalide, sulfide, Halometallat-, cyanometalate, Carbonylmetallat-, Haloborat-, halophosphate, and Haloarsenat- Haloantimonatanionen and the anions of oxygen acids of halides of sulfur, of nitrogen, phosphorus, carbon, silicon, boron and the transition metals selected. are preferred as the halide fluoride, chloride, bromide and / or iodide ions, pseudohalide as cyanide, cyanate, thiocyanate, isothiocyanate and / or Azidanionen, sulfide anions as sulfide, hydrosulfide, polysulfide and / or Hydrogenpolysulfidanionen, Halometallatanionen as chlorine and / or Bromaluminate and / or -ferrate as Cyanometallatanionen hexacyanoferrate (II) - and / or - (III) anions, as Carbonylmetallatanionen Tetracarbonylferratanionen as Haloboratanionen tetrachloro- and / or Tetrafluoroboratanionen, as halophosphate, Haloarsenat- and Haloantimonatanionen hexafluorophosphate, hexafluoroarsenate, Hexachlorantimonat- and / or Hexafluorantimonatanionen as well as anions of oxygen acids of halides, sulfur, nitrogen, phosphorus, carbon, silicon, boron and the transition metal chlorate, perchlorate, bromate , lodat-, sulfate, bisulfate, sulfite, bisulfite, thiosulfate, nitrite, nitrate, phosphinate, P hosphonat-, phosphate, hydrogen phosphate, dihydrogen phosphate, carbonate, bicarbonate, glyoxylate, oxalate, Deltaat-, square, Krokonat-, rhodizonate, silicate, borate, chromate and / or Permanganatanionen used. In the same way, suitable organic anions are basically all anions into consideration, the (C) form with organic or inorganic cations of the ionic liquids no crystalline salts whose melting point above 150 0 C, is located, and the no undesirable interactions with the organic or inorganic cations such as chemical reactions go. known. Very particularly preferably acetate anions can be used. In particular, 1-ethyl-3-methylimidazolium acetate (EMIM Ac) as the ionic liquid (C). The temperature are solubilized in which the above-described polymers (A) and optionally the above-described additives (B) in the chaotropic liquid (C) depends primarily on the temperature range in which the chaotropic liquid (C) is liquid , according to the thermal stability and chemical reactivity of the materials to be solubilised (A) and (B) as well as the rate of solubilization. Thus, the temperature should not be so high that it comes in the solubilization to a thermal decomposition of the substances (A) and (B) and / or undesirable reactions between them. On the other hand, the temperature should not be set so low that the rate of solubilization for practical requirements is too low. Preferably, the solubilization at temperatures of 0 to 100 0 C, preferably 10 to 70 0 C, particularly preferably from 15 to 50 ° C and especially 20 to 30 0 C.
In terms of method, has the solubilization in the first step has no special features but can using conventional mixing units such as stirred tanks, Ultraturrax, inline dissolvers, Homogenisierungsaggregate as homogenizing nozzles, kneader or extruder, continuously or discontinuously in batch mode. The content of polymer (A) of the first process step the resulting solution or dispersion (AC) or (ABC) may also vary widely. In general, the upper limit of the content in each individual case is determined by the fact that the viscosity of its solution or dispersion (AC) or (ABC) must not be so high that they can not be processed. Preferably, the content is 0.1 to 10 wt .-%, preferably 0.25 to 5 wt .-% and in particular 0.5 to 3 wt .-%, based on (AC) or (ABC). In the further course of the process according to the invention, the solution obtained in the first step or dispersion (AC) or (ABC) with an inorganic protic polar liquid (D1) is contacted in the second step. The inorganic protic polar liquid (D1) is connected to the above-described chaotropic liquid (C), preferably without miscibility gap, that is, in each ratio, miscible. In contrast, the polymer (A) in (D1) is substantially or completely insoluble. The optional additives (B) may be soluble or insoluble in (D1). As inorganic protic polar liquid (D1) is used in particular water. The solution or dispersion (AC) or (ABC) can be used in different ways with (D1), in particular with water, are brought into contact, for example by pouring the solution or dispersion (AC) or (ABC) in the liquid (D1) , is added dropwise, einsprüht or extruded, or in the form of a film with the liquid (D1) or its vapor (D1) into contact. This can be performed continuously or discontinuously in batch mode of operation. Preferably, the solution or dispersion is (AC) or (ABC) in the liquid (D1) was dropped in the form of droplets or sprayed such that can form in the contact with (D1) balls or beads. Here, the ratio of solution or dispersion (AC) or (ABC) to liquid (D1) from case to case, can vary widely. It is essential that the amount ratio is chosen so that the polymer (A), particularly the polysaccharide (A), is quantitatively precipitated or regenerated. The expert can thus easily determine the required amount of money based on his general knowledge optionally with the aid of a few exploratory experiments. The temperature at which the second process step is carried out may also vary widely. Primarily, the temperature depends on the fact in which temperature range the liquid (D1) is liquid. Also, the solution or dispersion should (AC) or (ABC) upon contact with (D1) have too high temperatures because there may otherwise an abrupt evaporation and / or decomposition of the liquid (D1). Preferably, the second process step is also carried out at temperatures of 0 to 100 0 C, preferably 10 to 70 0 C, particularly preferably from 15 to 50 ° C and especially 20 to 30 0 C.
In the second step a phase results (E), the solid polymer (A), in particular solid polysaccharide (A), chaotropic liquid (C) and liquid (D1) and optionally the at least one additive (B) or consists of, as well as a liquid phase (F), the chaotropic liquid (C) and liquid (D1) contains or consists of. Preferably, the phase (E) already has the preferred form of spheres or beads. the phase (E), preferably is preferably kept for 10 minutes to 24 hours, particularly preferably 20 minutes to 10 hours and especially 30 minutes to 2 hours, in contact with the liquid (D1) before carrying out the third process step during a certain time , so may that the desired shape of the phase (e), in particular the spherical form or the form of beads form complete and mature. In the third method step, the phase (E) of the phase (F) is separated off. This can be done in different ways, preferably by decantation, centrifugation and / or filtration. This process step also can be continuously or discontinuously in batch mode. In the further course of the process in the fourth method step, the chaotropic liquid (C) from the phase (E) using the liquid (D1), thereby a wet gel (G) on the basis of the polymer (A), in particular polysaccharide ( A) results. Preferably, the chaotropic liquid is removed (C) by washing out the phase (E) at least once with the liquid (D1), after separating the washing liquid (D1) of the phase (E). The continuous or discontinuous methods described above may be used. Preferably, the washing and separation is continued until in the wet gel (G) and / or in the washing liquid can be detected more (D1) no chaotropic liquid (C). Preferably, the fourth step is carried out at temperatures at which the resulting wet gel (G) is not thermally damaged, especially not aging rapidly. Preferably, temperatures from 0 to 100 0 C, preferably 10 to 70 0 C, particularly preferably applied from 15 to 50 0 C and in particular 20 to 30 0 C.
Preferably, also, the resulting wet gel (G) on the three-dimensional shape as the already produced therefrom material of the invention. In the further course of the process according to the invention is in the sixth step, the (D2) containing gel (G) with the liquid (D1), in particular with water, treated. Preferably, the treatment takes place in that the (D2) containing gel is brought into contact (G) at least once with the liquid (D1), followed by (D1) in each case for a certain time, preferably 1 minute to 2 hours, at (G) allowed to act and then separated. In the case of the preferred spheres or beads according to the invention this is preferably done in that one stirs balls or the beads in the present invention (D1), and then separated by centrifugation, decantation and / or filtration. At the last separating (D1), that is, in the seventh method step, the wet material according to the invention results. The wet material according to the invention can be dried in the eighth step. Moreover, in a further method step, at least one further additive can the wet or dried material according to the invention, which is free from additives (B), at least one additive (B) or the wet or dried material according to the invention which already contains at least one additive (B) (B) are added. In the inventive method, at least one of the process steps can be carried out kPa greater than 100 at a pressure. Preferably, the method of the invention is carried out generally at normal pressure. It is a very special advantage of the method is that it directly provides the inventive materials in very reproducible manner. It also allows the inventive method, the inventive materials in a wide variety of predetermined three-dimensional shapes such as the shapes described above, targeted and highly reproducible manufacture. Due to the precise adjustment of its dimensions materials of the invention can be safely and reliably assembled into more complex three-dimensional moldings. Through the above-described additives (B) materials of the invention for use in the invention in vielfältigster way can be modified. Communications technology, radio and television equipment, agricultural engineering, aviation and space technology and textile technology, and the construction, land and sea creatures and mechanical engineering, in particular as support particles, the support materials or proppants, construction materials, insulation, fabrics, absorbents, adsorbents, membranes, separation materials, barrier layers, controlled release materials, catalysts, cultivation media, catalysts, as well as coloring, fluorescent, phosphorescent, electrically conductive, magnetic, microwave radiation absorbing and flame-retardant materials or used for their preparation. In particular, materials as well as the present invention, the solid, porous materials produced by the novel method can be used on the basis of biopolymers (A) in the oil and gas handling equipment. In the framework of this use according to the invention, the solid materials are preferably used as a powder, especially powder having spherical particles such as spheres or beads. They are preferably used as deformable, pressure-resistant support particles, the support materials or proppants in liquid media for fracturing or well stimulation. In this case, liquid media may be used on the basis of water or oil. The resulting liquid media for fracturing invention - in short, "fracturing media" - can further customary and known constituents in addition to the inventive proppants, such as proppants, protective coatings, materials for weight modifier described in the American patent application US 2006/0151 170 A1 , gelling agents, cross-linking agent, yellow computing means, curable resins, hardening agents, surface-active compounds, foaming agents, means for separating emulsions, clay stabilizers and / or acids. The inventive fracturing medium with the inventive proppants is pumped to the breaking of the rock under pressure into the conveyor horizon. Exceeds the hydrostatic pressure of the fracturing fluid to the fracturing gradient of the conveyor horizon, this tearing at defects, and inventive fracturing medium which penetrates into the aufreißenden or already-open columns, cracks and channels. After the reduction of the hydrostatic pressure of the fracturing medium of the invention proppants of the present invention effectively prevent and for a long time, the sealing of the gaps formed, cracks and channels through the overlying rock. There also is no or only a very low formation of particulate abrasion of rock and / or crumbs of proppants. Overall, a better long-term exploitation of the conveyor horizon results. This all reinforces the extraordinary advantageousness of the materials of the invention and of the method according to the invention and the hereby produced, solid, porous materials based on polymer (A). A one percent solution of cellulose in 1-ethyl-3-methylimidazolium acetate (EMIM Ac) was added dropwise with stirring in a water-filled beaker (comparative experiment C1) or in a filled with ethanol beaker (Comparative Example C2). When using water (Example C1) it was necessary to add a drop of wetting agent to lower the surface tension of water and allow the formation of beads. During the period in which the resulting beads reached the bottom of the beakers, they had stabilized to the point that there is no risk of deformation was more. After the addition of the cellulose solution was allowed to attack the beads during each hour. The contents of the beakers were stirred uniformly to prevent deformation of the beads. Subsequently, the beads from the water-EM IN Ac-solution (Comparative Example C1) and the ethanol-EMIM Ac-solution (Comparative Example C2) were separated by filtration and dried for 2 hours in a forced air oven at 80 0 C.
In two comparative experiments dried beads of a diameter of about 1 mm resulted with a compact and uniform structure without a core-shell structure. A one percent solution of cellulose in EMIM Ac was added dropwise with stirring in a water-filled beaker. The water had been added to lower the surface tension of water and allow the formation of beads, a drop of a wetting agent. During the period in which the resulting beads reached the bottom of the beaker, they had stabilized to the point that there is no risk of deformation was more. After the addition of the cellulose solution was allowed to attack the beads during each hour. The contents of the beaker were stirred uniformly to prevent deformation of the beads. Subsequently, the beads were separated from the water EMI M Ac-solution by filtration, treated with ethanol for one hour and 20 minutes rinsing with water. Subsequently, the water-wet beads were dried in a forced air oven for 2 hours at 80 0 C.
The result was dried beads having a diameter of about 1 mm with a strong and uniform core-shell structure. The trays had a uniform thickness in the range of 30 to 50 microns. They were clear and transparent and slightly softer than the cores. The cores were opaque and harder than the shells and exhibited a substantially uniform porous structure having pore diameters in the range of 1 to 5 microns on. For Example 2, the cellulose beads 1 of Example 1 was used. For Comparative Experiment V4, the cellulose beads C1 of example C1 were used. The cellulose beads 1 (Example 2) and V1 (Comparative Example C3) were swollen separated from each other in a one percent aqueous solution of a dye (trisodium salt of pyrene trisulfonic acid) for one hour. Subsequently, the cellulose swollen beads were dried for 1 and C1 for 2 hours in a forced air oven at 80 0 C. 5 each of the dried, laden with dye cellulose beads 1 and C1 were added separately from one another in each case a water-filled cuvette. Subsequently, the leaching behavior of the dye-loaded cellulose beads 1 and V1 by UVA / IS-spectroscopy the intensity of the absorption of the dye at 207 nm on the basis of change was measured in the water. In this case, it was found that the dye was leached with essentially the same speed from the cellulose beads 1 and V1, but that the cellulose beads had one significant added more dye than the cellulose beads V1, so that it took significantly longer for the dye completely from the cellulose beads 1 was exhausted. This underscored the fact that the cellulose beads 1 showed a much higher absorption capacity than the cellulose beads V1. Example 1 was repeated, so that the cellulose beads resulted having particle sizes of 800 microns to 1, 6 mm. Subsequently, the application properties that are essential for use as a proppant were measured (Example 3). For purposes of comparison, the corresponding performance properties were measured by commercially available proppants. It was in the comparative experiment V4 sintered bauxite (high pressure-resistant, ceramic material) and uses an uncoated fracturing sand in the comparative experiment V5. There were obtained the following results. The compressive strength of cellulose beads 3 was determined to ISO 13502-2. For this purpose, in each case 40 g of the proppants were (5.02 cm) packed into a steel cell with 2 inch diameter and loaded with the indicated in Table 1 pressure. Then, the amount of the resulting fine particles was determined. The results in Table 1 established that the powder on the basis of cellulose (A) was clearly superior in compressive strength to conventional proppants. As is known, the proppants of the fill introduced into the rock channels. What is important here is that the permeability of the channels is retained and is as little as possible reduced by the proppants. This is mainly achieved in that round, spherical particles are used as possible. Therefore, roundness and sphericity of the proppant according to ISO 13502-2 were determined. The results are shown in Table 2. The results underlined the fact that the cellulose beads 3 of Example 3 had a significantly better sphericity and a significantly better roundness than the standard fracturing sand (comparative experiment V5) and (in this respect the sintered bauxite Comparative Experiment V4 ) were equal. Proppants once the fracturing medium penetrates into the rock formed channel. Section 9, "Bulk density and specific gravity" measured. The results are shown in Table 3. They underscored the fact that the cellulose beads 3 of Example 3 was clearly superior to the conventional proppants in this regard. Conductivity and permeability: Ultimately, it is crucial for the use of the cellulose beads 3 of Example 3 as proppants whether the conductivity and permeability of the rock columns are maintained over a longer period. Therefore, the conductivity and the permeability of a model gap in Ohio Sandstone at a loading of 2 lb / ft2 (95.76 Pa) with a two percent potassium chloride solution according to API RP 61 were determined. 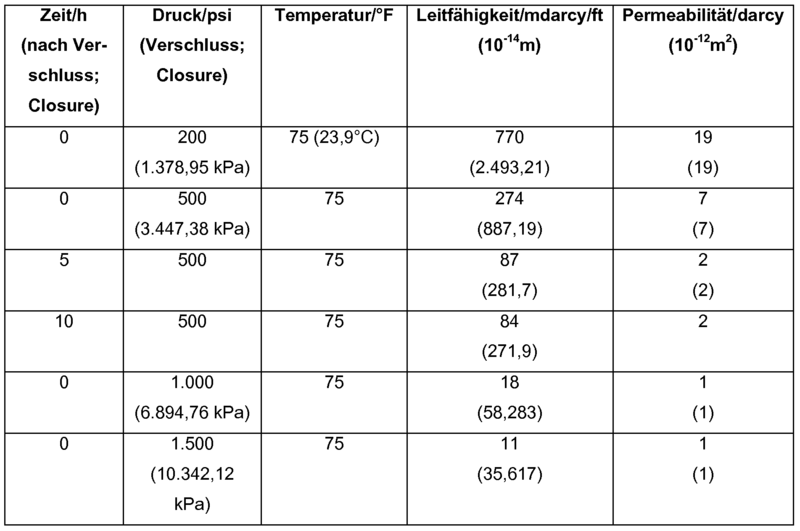 The results are shown in Table 4. established that at moderate pressures and temperatures even after 10 hours still remained a significant residual conductivity, which meant that the cellulose beads were 3 of Example 3 useful as proppants. 1. Solid, porous materials having a core-shell structure on the basis of synthetic polymers and biopolymers (A), which in chaotropic liquids (C) and soluble in polar protic inorganic liquids (D1) and protic polar organic liquids (D2) insoluble are. 2. Solid, porous materials according to claim 1, characterized in that they are porous. 3. Solid porous materials according to claim 1 or 2, characterized in that their nuclei are coarsely porous or finely porous. 4. solid porous materials according to claim 3, characterized in that their nuclei are pored. 5. solid porous materials according to claim 4, characterized in that the pores of the cores have a diameter of 50 nm to 10 microns. 6. Solid, porous materials according to one of claims 1 to 5, characterized in that their nuclei are harder than their shells. 7. solid porous materials according to one of claims 1 to 6, characterized in that their shells are more compact than their nuclei. 8. Solid, porous materials according to claim 7, characterized in that the pores of the shells have a diameter of 1 to <50 nm. 9. solid porous materials according to one of claims 1 to 8, characterized in that their shells have a thickness of 1 to 100 microns. 1 1. Solid porous materials according to claim 10, characterized in that they have the form of spherical particles. 12, solid porous materials according to claim 1 1, characterized in that the spherical particles have the form of spheres or beads. 13, solid porous materials according to claim 1 1, characterized in that the balls or beads have a measured by sedimentation in a gravitational field average particle size of 0.1 to 10 mm. 14. Fixed porous materials according to one of claims 1 to 13, characterized in that the biopolymers (A) polysaccharides. 15, solid porous materials according to claim 14, characterized in that the polysaccharides (A) are structural polysaccharides. 16, solid porous materials according to one of claims 1 to 15, characterized in that it comprises at least one additive (B) selected from the group consisting of low molecular weight, oligomeric and polymeric, organic, inorganic and organometallic compounds, organic, inorganic, and organometallic nanoparticles and microscopic and macroscopic particles and moldings, biomolecules, cell compartments, cells and cell contained. 17, solid porous materials according to one of claims 1 to 16, characterized in that the chaotropic liquid is liquid (C) in a temperature range from -100 0 C to +150 0 C.
18, solid, porous materials treated claims 1 to 17, characterized in that the chaotropic liquid (C) is an ionic liquid. 19, solid porous materials according to one of claims 1 to 18, characterized in that the inorganic protic polar liquid (D1) is water. 20, solid porous materials according to one of claims 1 to 19, characterized in that the protic polar organic liquid (D1) is an alcohol. 21, solid porous materials according to claim 20, characterized in that the alcohol (DI) is ethanol. (8) the moist, solid, porous material (A) or (AB) is dried. (9b) has at least one further additive (B) is added to the wet or dried, solid, porous material (AB). 22 to 24, characterized in that they see in the process rode (2) solution obtained in process step (1) or dispersion (AC) or (ABC) with the liquid (D1) contacted 25. The method according to any one of claims by the solution or dispersion (AC) or (ABC) in the liquid (D1) pouring, is added dropwise, einsprüht or extruded, or in the form of a film with the liquid (D1) or the vapor of the liquid (D1) brought into contact. 27. The method according to any one of claims 22 to 26, characterized in that is separated in step (3) the phase (E) of the phase (F) by decantation, centrifugation and / or filtration. 28. The method according to any one of claims 22 to 27, characterized in that the phase (E) at least once with the liquid (D1) are washed out in step (4), after which the washing liquid from phase (E) is separated off and the resulting wet gel (G) isolated. 29. The method according to any one of claims 22 to 28, characterized in that the content of the solution or dispersion (AC) or (ABC) of the polymer (A) 0.1 to 10 wt .-%, based on (AC) or ( ABC) is. 33. Use according to claim 32, characterized in that the support particles, the support materials or proppants are used in liquid fracturing media for well stimulation in which natural gas and crude oil production.